L-tyrosine is an amino acid that is purported to help boost flagging energy levels or reduce fatigue-related memory problems, often attributed to hormonal insufficiencies due to adrenal fatigue or poor thyroid function. You will find L-tyrosine in tablet, capsule and pill forms. Though some books and websites claim it has no side effects, you need to consult a doctor before trying this supplement -- especially if you have high blood pressure or another medical condition. Adrenal fatigue is often discussed in health books and on the Internet, though it is not a recognized medical diagnosis. Your body’s adrenal glands produce numerous essential hormones. Adrenal insufficiency, in which your adrenal glands produce an insufficient amount of a hormone due to an underlying disease, is a recognized medical diagnosis. Adrenal fatigue is purported to include an array of nonspecific symptoms including fatigue, body aches, digestive problems, nervousness and trouble sleeping. Adrenal insufficiency symptoms include fatigue and body aches along with loss of weight and body hair, low blood pressure and lightheadedness. Proponents of adrenal fatigue as a diagnosis point to it as a mild form of adrenal insufficiency that is caused by chronic stress, notes MayoClinic.com. L-tyrosine is advocated as a supplement that may help resolve stress-related hormone imbalances. The theory behind adrenal fatigue is that it’s a mild form of adrenal insufficiency which is caused by chronic stress. L-tyrosine is recommended for its beneficial effect on both adrenal and thyroid hormone production in cases of chronic stress, says “The Stress Effect” author Richard Weinstein. Your adrenal glands convert this amino acid into epinephrine and norepinephrine, which stimulate your sympathetic nervous system. Norepinephrine increases alertness and elevates your mood. Your thyroid uses it to make thyroxine, which regulates your body temperature. 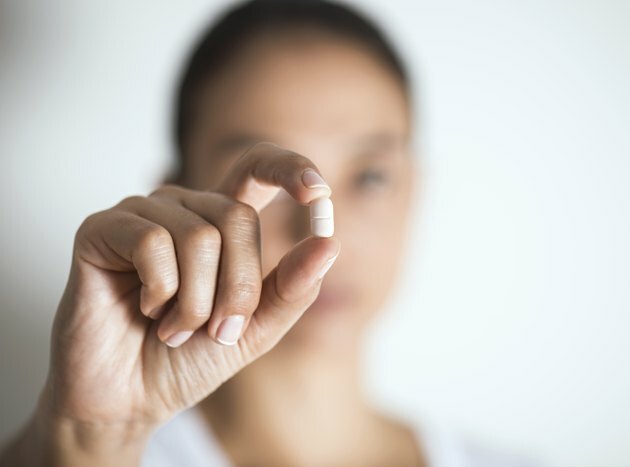 Supplemental L-tyrosine helps you if you are suffering from adrenal fatigue with symptoms such as cold hands and feet and depression, Weinstein says. A commonly recommended dose for L-tyrosine is 500 mg. The best time to take it is upon waking, advises “No More Fatigue” author Jack Challem. Wait 15 minutes before consuming food or any other liquid besides water. If you have high blood pressure, consult your doctor about using L-tyrosine to boost your energy because it may worsen your condition. Also avoid it if you are prone to migraine or vascular headaches. Consult your doctor for other possible side effects and interactions. MayoClinic.com endocrinologist Todd B. Nippoldt cautions against using unproven remedies such as L-tyrosine to alleviate adrenal fatigue or hormone imbalances. Unproven remedies for this unproven condition may cause you to feel even worse. Meanwhile, the real cause — such as fibromyalgia or depression — may continue to affect your body, says Nippoldt.